Of the many ways to build a keyboard, some are better than others. The kind of differences involved are subtle. How much force is required to actuate one of the keys? What does the key sound like when it hits the bottom of the tray? Is there tactile feedback? How far do you have to move the key for actuation? If you’re a casual PC user, then these kind of differences will be mostly lost on you. But if you’re someone who spends hours behind a keyboard every day, then they can make all the difference in the world. Just ask any programmer, typist, or PC gamer. The cheapest keyboards on the market tend to use rubber dome switches. Mechanical switches are superior in nearly every way, but mechanical devices are also more expensive to make. The Fujitsu Realforce R2 Keyboard actually makes use neither rubber dome nor ordinary mechanical switches. Instead, it uses Topre switches. And those are a bizarre hybrid of several technologies. Though the differences between Topre switches and mechanical switches are largely a matter of taste, some of them are more concrete. 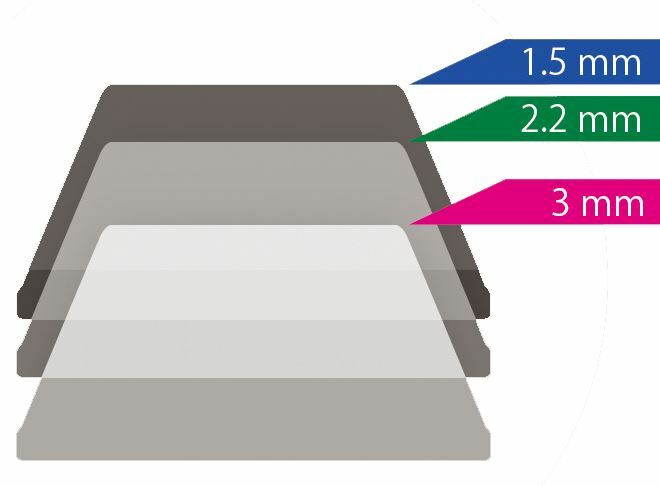 For example, Topre can offer variable actuation points. Then again, there’s nothing wrong with having personal preferences. Some people will prefer the feel of Topre switches, and that’s as important as any feature could ever be. Of the two versions of the Fujitsu Realforce R2 keyboard, this is the tenkeyless version. That makes the board about one fifth smaller than a full sized board. If you don’t many frequent use of the number pad, removing it is a great way to save space. Compared to the full version, you’ll also save a few bucks in the process. The R2 measures 14.5 x 5.6 x 1.2-inches, and weighs about 2.5lbs. Outwardly, the aesthetic of the board is highly professional. A grey-black matte finish is combined with darkened keycaps, creating a very subdued style. Though the keyboard layout itself is terribly standard, that’s really for the best. In the top right hand corner of the keyboard, the Realforce logo is placed in a grid of highlighted space. The board would be totally non-descript without their logo. But given the general prestige around Fujitsu and Topre, many people will have no problem forgiving the placement of the logo. If nothing else, the highlighting makes it easier to see the num-lock, caps lock, scroll lock, and key-lock keys. The Fujitsu Realforce R2 Keyboard is a Tenkeyless board. That refers to a standard layout, minus a number pad. The omission removes about twenty keys from the board, and also helps to free-up a few inches of space. Depending on how you have your mouse positioned, the relationship between your left and right hand can become slightly more strenuous. Ergonomics aside, cramped desk space is always something that’s nice to reclaim. Like almost any keyboard in this price range, the Fujitsu Realforce R2 Keyboard offers full n-key rollover. That means the board can always keep up with you, no matter how fast you start to throw out inputs. And it works, you can roll both hands across the board and never encounter any problems. At worst, the software you’re using will start lagging before the keyboard ever will. Occasionally, brands that don’t really understand keyboards will still make them. It’s clear that Fujitsu understands the engineering behind a good keyboard because the design of the board itself is sound. The ergonomic design takes advantage of step-sculpture architecture, helping to guide your fingers from one row of keys to the next. These seemingly small distances can actually add-up, especially when you’re doing lots of typing. Because the Fujitsu Realforce R2 Keyboard makes use of Topre switches, this board is capable of variable actuation point settings. When you’re using a traditional Cherry MX switch, the input is totally binary. Just about the only thing you can do to affect actuation is to install keyboard O-rings. With the built-in actuation point changer, Topre switches allowing you to move actuation from 1.5mm, to 2.2mm, to 3.0 mm. Using the 1.5mm setting, you scarcely have to touch the key for actuation to occur. With the 3mm setting, basically have to bottom-out the key for actuation of the key. Topre switches are confusing to many people, and understandably so. Their construction is a bizarre hybrid of mechanical and non-mechanical designs. Like a dome keyboard, Topre switches contain a dome which is depressed by keystrokes. When you push down, the resistance against your finger is largely the result of the rubber dome being depressed downward. 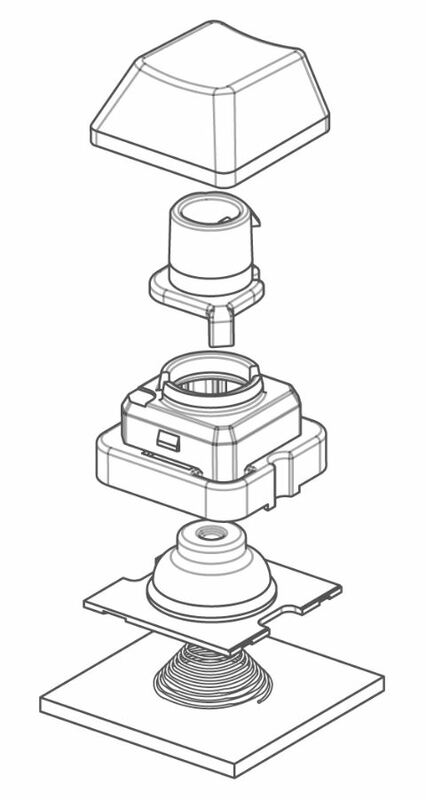 However, beneath the rubber dome portion is a spring, and a capacitive sensor. The sensor is what detects the actual keystroke, which occurs when the spring becomes pushed downward. The sensor is detecting the capacitance within the spring, so no physical contact is necessary for the components to register. If you’re looking for a comparison to mechanical boards, Topre switches have an actuation force that compares with Cherry browns. And browns are among the most standard mechanical switches. 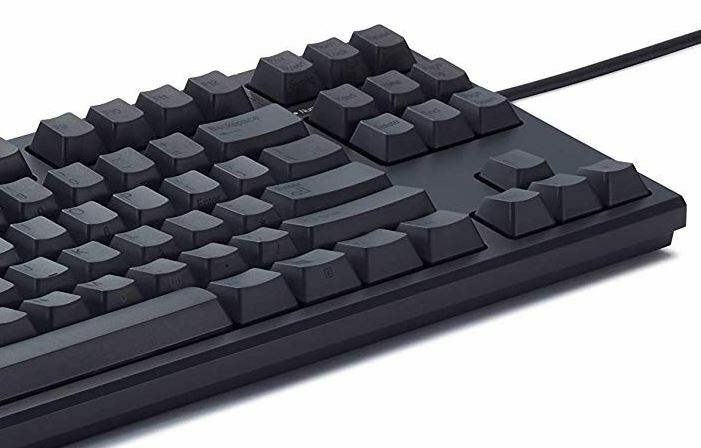 If you’ve played around with a mechanical keyboard but don’t remember what kind of switches it used, it’s likely they were Cherry brown or their rough equivalent. Often times, mechanical switches essentially feel like you’re pressing into a spring. In some cases, it’s really not far more complicated than that. But being hybrids, Topre switches have a nice bouncy feeling in each stroke. Unlike rubber dome switches, your fingers don’t have to bottom out for actuation. It’s a best of both worlds scenario, where you get the best aspects of comfort from both types of design. A good pair of Cherry MX switches are usually rated to last been 20-50 million keystrokes. The Fujitsu Realforce R2 Keyboard (Tenkeyless) and its Topre switches are built to last for 50 million keystrokes. Keystrokes aside, it’s important to look at the keycaps themselves. Not many people understand the difference between ABS and PBT plastic, but using PBT keycaps is actually one of the bigger features of this board. 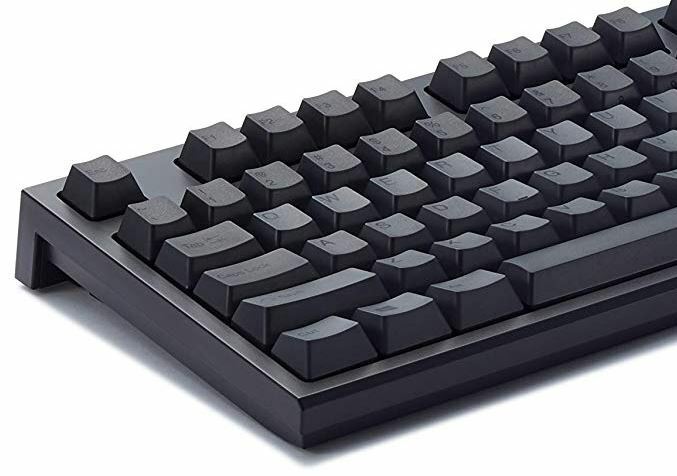 ABS plastic is widely used on products like keyboards because it’s cheap, durable, and easy to construct. However, over extended periods of use, ABS plastic becomes polished by contact with human skin. Keycaps made from ABS will eventually develop an oily texture and a glossy sheen. There’s a distinct sound made by ABS being pushed into the bottom of a keyboard. 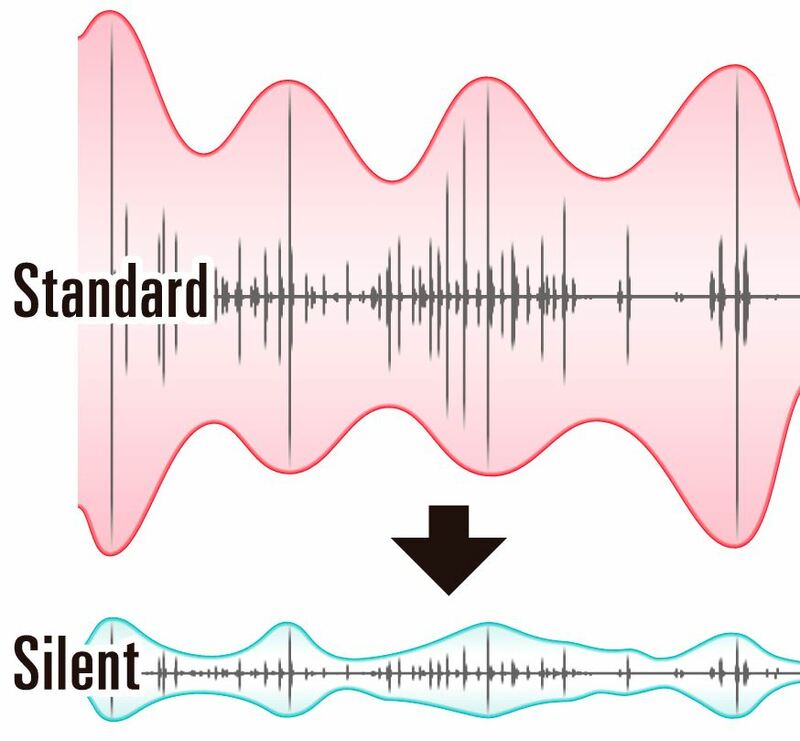 The sound made by PBT is slightly different, and generally regarded as lighter and less obnoxious. It’s not tough to find a comparison between these sounds on YouTube. These kinds of things come down to personal preference, but many people seem to have a mild preference for the sound of PBT. With respect to its durability, PBT is about the same as ABS. But PBT does far better at resisting chemical interactions, which is why it’s great at holding off the polishing effects of contact with skin. This is what allows PBT keys to keep their texture for far longer than ABS keys. But it’s not particularly cheap or easy to mold PBT keycaps. If you’re an enthusiast, you may already know that a full set of PBT keycaps from a respected manufacturer will cost you around $50. And that would be for entry-level keycaps, with specialized PBT keycaps easily costing hundreds. As your fingers polish down the keys, keycap lettering can get worn away. There are half a dozen different ways to permanently create lettering within keycaps, each more complicated than the next. With the Fujitsu Realforce R2 Keyboard, keys are labeled with dye-sublimation. The general idea is to create a permanent stain upon the plastic, so you can’t wear it off with your fingers. If you were truly determined to remove the stain, it’s doubtful that it could be done without destroying the key itself. In any case, the lettering will never wear out from normal use. Some people prefer keyboards with backlit LEDs to enhance their lettering. Admittedly, those boards are very stylish. But if you’re someone who’s thinking about using Topre switches like those inside the Fujitsu Realforce R2 Keyboard, then you’re probably someone who doesn’t have to look at their keyboard very often. People who love their keyboard will sometimes want to customize it. Custom keycaps are somewhat easier to find for common mechanical switches. Though Topre is only one brand among many, they’re actually surprisingly popular in their own way. Consequently, the challenge to find custom keycaps is greater than with mechanical keyboards. But it’s certainly far from impossible. Perhaps equally important, few people will need to think about changing to custom keycaps. Because unlike many high end keyboards, the Fujitsu Realforce R2 Keyboard has respectable keycaps of its own. Who Should Choose the Fujitsu Realforce R2 Tenkeyless Keyboard? Keyboards like this are made for people who use their PC constantly. Whether or not you’ll enjoy Topre switches is a matter of taste. Among people who have tried both mechanical switches and Topre switches, some people develop strong preferences. Some people feel both are about the same. People who have suffered wrist injuries can tell you, moving from rubber dome keyboards to mechanical keyboards can be much easier on your wrist. Topre switches are similarly easy on the wrists because they require comparable actuation force to mechanical switches. They can even use variable adjustment for key actuation, which is similar to being able to switch between several different types of Cherry switches on the fly. And if you like tactile feedback from your board, you may fall in love with the bouncy feel of the keys. In either case, the Fujitsu Realforce R2 Keyboard (Tenkeyless) is an excellent choice for programmers, writers, and gamers alike. It’s not the simplest board on the market, but few will argue it’s not among the best.